Raised speed tables are a great way to slow traffic for crossings and areas where there are lots of pedestrians such as bus stops, schools and shopping venues. We offer many sizes of rubber speed table but to keep things simple we have listed a single kit here for a "double carriageway" of 6.8m wide. This kit is a "combination" type meaning it is infilled in the centre with tarmac or your choice of material. If you need anything different to this kit give our sales line a call and they will assist you in getting the best kit for your needs. Our speed tables are made from rubber modular sections allowing us to achieve almost any shape and size of speed table. 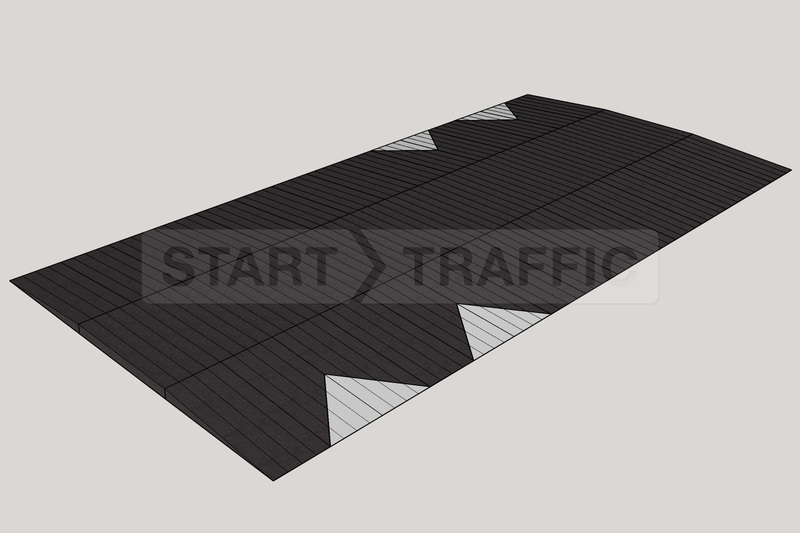 Completely Rubber tables can also be produced by infilling the centre with rubber modules rather than tarmac, this is similar to our raised zebra crossing kit. Easy Bolt Down Installation - The whole speed table can be installed without any excavation, meaning no waste spoil to be removed from the site. Modular easy to handle components - no heavy lifting equipment required to install the speed table. Quiet Operation - The rubber material the ramps are made from makes them quiet during operation. Kerb To Kerb or Independent - Although this listing is for a straight kerb to kerb kit, there are options for independent tables with "end caps". High Visibility - Optional moulded in markings make the table ramps easy to spot for motorists. There are two key types of speed table that are available, combination and all rubber. But what are the differences? The diagrams below show the different types of speed tables that we can provide. Not sure which best suits your needs? Our speed table experts are able to help, just give us a call. All rubber speed tables have no infill and are completely made of rubber. These are available to order by phone, or as a 6.9m kit on this page. The inner section of this is infilled with tarmac which will need to be purchased separately. The kit on this page is a combination speed table. These can be supplied in any size, please phone for more information on speed tables with ends, or see our speed cushions page. 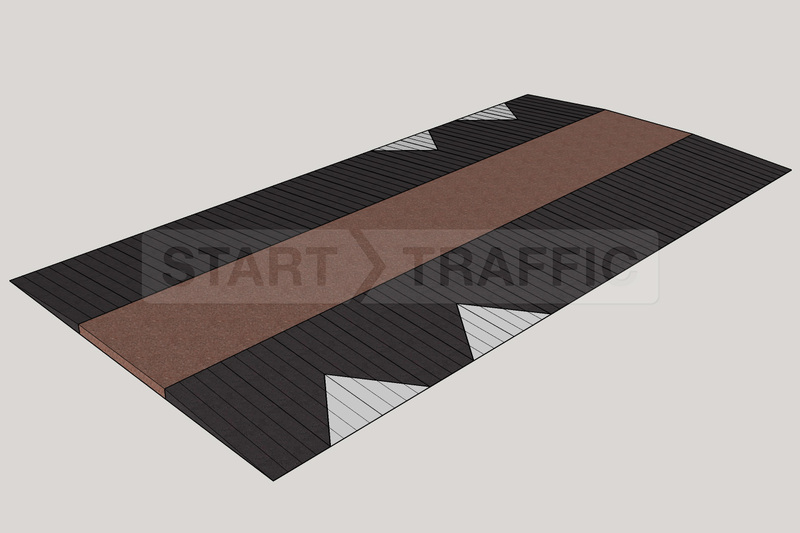 This listing is for the less severe 1:16 ramp gradient, we do also offer a steeper 1:10 gradient ramp that is available to order by phone. A steeper gradient is better suited to installs where the traffic speed needs to be vastly reduced. We have included a reference guide of the different dimensions of the ramp sections. Need help with getting the right speed table for your needs? We have a site survey team who are able to visit a site and assess what product may be best for your installation. Not sure about how to install these? We can help with installation of the product too! Give us a call before ordering and we will help with the whole process from specification to installation we will ensure you get the right product for your needs. Do you have questions about our speed tables? Give us a call on 01905 794 875, our sales team will happily assist you with any questions you may have about this range of rubber speed tables. Length 3000mm (minimum) | More infill can be used to make the ramp "longer"